Our Spooks and Legends Tour is over, and there have been several calls for an encour tour from those who missed it. Sadly, they'll have to wait till next year, but we thought this Halloween week we would share a story or two from the highly anticipated walk! Formerly known as Transylvania Park, Central Park is one of the oldest municipal parks west of the Allegheny Mountains. Today we associate Central Park with a place of leisure and remembrance, but this wasn't always the case. In fact, in Henderson's earliest days the park was associated with justice and death. When Charles Carr was convicted for the murder of Lemuel Cheaney in 1819, he sealed his fate in history as the first person to officially be executed in Henderson, on July 26, 1819. As was the custom at the time, a crowd gathered to watch Carr's hanging. After officials pronounced him dead, he was placed in a coffin and buried in Central Park. The first and only woman to be legally executived in Henderson County also met her fate in Central Park in 1834. Hannah Hazelwood had been convicted for the murder of a Hicks child. The last legal execution to take place in Henderson County was that of Robert Charlton on Feb. 5, 1892. Later that year all prisoners condemned to death were sent to Eddyville Penitentiary. In the 1940s, Central Park was also the site of murder. Two men were arguing on a Saturday afternoon in the park, apparantly over a girl. One of the men stabbed the other, who later died at the hospital. The murderer confessed to the crime and was sent to Eddyville Penitentiary. Of course, the park now offers a serene and inviting location for leisurely strolls, child's play and honoring fallen heroes. It has been and will continue to be a deeply-rooted and important part of our city's heritage! Want to hear the tale of the nation's first serial killers, and their connection to Henderson, Ky.? Then join us Saturday, October 16 for the Spooks and Legends of Old Henderson Walking Tour! It has been so much fun gathering new stories for this year's event! We don't want to give too much away, but will tell you that the stories include robberies and murders, medical oddities and tricks too gruesome to be made up! We will have multiple tours leaving from the Depot, which is located on the Henderson riverfront at the intersection of First and Water Streets at 2 p.m. and again at 5 p.m. Because the stories contain adult content, parental guidance is suggested. Refreshments will be served prior to the tours. The event is FREE and no pre-registration is required! The Community Room staff and Henderson County Historical and Genealogical Society have been working together this month to bring you a new exhibit featuring photos and memorabilia from the olden days of Henderson. Some of the businesses featured in the exhibit include Mann Brothers, Coquillard (Henderson) Wagon Works and the Baskett Coal Company. The above photo shows how downtown was transformed when it was time for area farmers to sell their tobacco. Boy, does downtown Henderson have a rich haunted lore! Our in-house ghost detective, Tamara, has been on the hunt for new legends and lore to add to this year's Spooks and Legends of Old Henderson Walking Tour, and she has found some great ones! And though we'd love to share those stories with you now... well, you'll just have to wait till October 16! On that afternoon join us as we weave these haunted tales with historical facts about Henderson, Ky., on a guided walking tour through the historic district! We might even have a few extra surprises in store! There will also be free refreshments available before and after each tour. Tours are scheduled for 2 p.m. and 5 p.m. on October 16, and best of all they're FREE. What a great way to celebrate the bewitching season with your older children. They'll be so entertained, they won't even realize they spent the afternoon learning about local history! Parental guidance is suggested, as some stories contain mild violence. 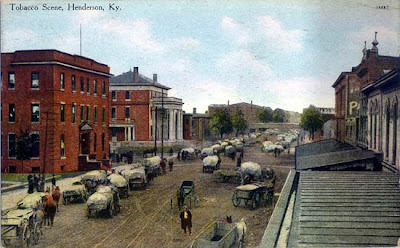 The tours leave from the Community Room, which is located at 101 N. Water St. in downtown Henderson, Ky.